Feeling Like You Can’t Offer the Best Care. Although you would like to be able to offer the best care, you might be feeling as though you aren’t capable. You might feel like you can’t meet your own personal expectations for caregiving or the expectations of the person you are caring for. 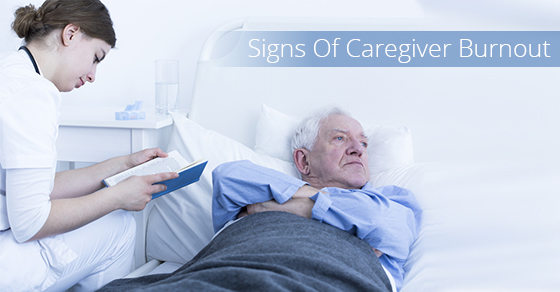 This is due to the physical and mental strain involved in your particular caregiving role. You Are Experiencing Symptoms of Depression. Symptoms of caregiver burnout and depression are very similar. Keep in mind that ‘feeling depressed’ doesn’t simply mean feeling sad. Symptoms of depression also include a sense of guilt, a lack energy every day or feeling as though you are moving slowly. You might feel like you aren’t interested in things you once used to enjoy. You may have trouble concentrating and have trouble sleeping. You might find yourself retreating away from family and friends. You Feel a Sense of Being Overwhelmed. In other words, you might feel very helpless. Similarly, you might like you being pulled in a lot of different directions. You Feel Like You Can’t Escape. In other words, you might feel trapped by your role as a caregiver and that there is nothing you can do about it. It’s important to stay connected to your family and community outside of your role as a caregiver, and to seek the support you need and deserve. You Might Want to Harm Yourself or your Patient. Do not be alarmed: this is a common reaction. This may be your mind and body’s way of telling you that you need to seek further support. Your Health, or perhaps the Health of your Patient, is Declining. Are you constantly sick with a cold? Are you losing weight or abusing alcohol or sleeping pills? Also, assess the health status of your patient. Although he or she may be declining in health for reasons beyond your control, make an honest assessment and determine whether some of your tasks and responsibilities have slipped. If you are struggling with caregiver burnout, allow C-Care to give you time to restore your physical and mental health. We offer a variety of affordable, high quality and personalized services. You will feel at peace knowing your loved ones are given the best possible care. Contact us today.